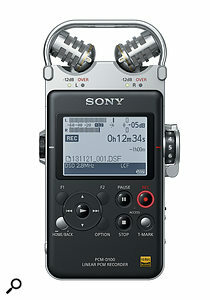 Unlike some of the other compact recording devices on the market today, Sony’s new baby isn’t awash with features. 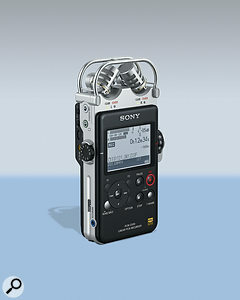 For example, there are no phantom-powered XLR/jack combo input sockets for connecting condenser and dynamic mics, it hasn’t got a guitar tuner, can’t perform multitrack recording or mixing, there’s no on-board effects processor and it doesn’t work as a computer interface (although files can be exchanged via a micro-USB port). It is possible to change the playback speed of audio without affecting pitch, though, and EQ it using a graphic interface and a number of presets — but that’s about the extent of the ‘added value’ functions. This is a deliberate decision, though, because with their PCM-D100, which replaces the six-year-old PCM-D50, Sony’s focus has been firmly on improving the technical specifications and general recording quality. That said, the PCM-D100 has plenty of useful features directly relating to the process of recording, including a five-second pre-record option, and the ability to record PCM and MP3 files simultaneously (see the New Limits box). And, importantly in my book, it has what its predecessors didn’t: a speaker built into its front edge, so that audio recordings can be auditioned without headphones. Sony haven’t skimped on the accessories either. The package includes a copy of Sony’s Sound Forge Audio Studio LE, a wireless remote control and transmitter, a furry windscreen for the mics, a carry case, four AA batteries, an AC adapter and a USB cable. Data storage being cheaper than it was six years ago, the D100 has 32GB to the D50’s 4GB. What’s more, it has a card slot that accepts SD, SD-HC, SD-XC, Memory Stick Pro Duo and Memory Stick Pro-HG formats, making it possible to add up to 64GB of memory, taking the total up to an impressive 96GB. The designers also found a number of ways to improve on the recording quality. They isolated the power supply to each circuit section, for example, and selected components specifically to reduce jitter and noise, resulting in far lower harmonic distortion figures. They’ve also added custom-designed electret mics that can handle higher SPLs (128dB) and have 50 percent larger capsules, matching those of their high-end D1 model. The D100 can also record at 176.4 and 192 kHz (the D50 topped out at 96kHz), and, perhaps most significantly of all, it records Direct Stream Digital (DSD) audio. For those unfamiliar with DSD, this is an alternative method of sampling which uses one bit, instead of the familiar 16, 20 or 24 used for PCM recording, but samples much more frequently; that frequency here is 2.8MHz — 64 times that of a 44.1kHz audio CD. DSD recording is reckoned by some to get closer to emulating an analogue waveform than standard PCM recording, and is often preferred as an archive format, although there’s still debate about which is better. The D100 may not be the only portable recorder to offer DSD support (back in 2007 Korg introduced the mid-priced MR1 and followed it with the MR2) but it’s still unusual. The main chassis is formed from aluminium, providing rigidity without adding much weight. 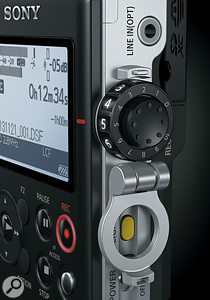 Inevitably plastic has been used too, most noticeably in the construction of the playback and record level knobs and the battery compartment lid, but the potentially fragile mics are well protected by metal roll bars; a high fall onto concrete might be more than the D100 can withstand, but it should be capable of surviving a few hard knocks. Although the PCM-D100 is large compared with some recorders, it’s not nearly as big as others and could be carried around in a fat pocket. It’s wider, deeper and longer than my Olympus LS5 recorder, but compared with Zoom’s H6, which I also had on my desk during the review, it’s significantly shorter, not quite as deep and is the same width, excluding its protruding level wheels. The level control comprises an interesting and useful dual-wheel assembly, with the inner wheel offering finer control.The top-panel buttons are fairly standard and comprise transport controls, two assignable function buttons, and others for navigating on-screen menus and selecting options. Controls relating to hardware inputs, such as a 20dB pad switch and mic/line selector, as well as all the I/O sockets, are found on the flanks, leaving the underside bare apart from a screw thread for mounting the recorder on a camera stand, and an elaborately designed battery compartment housing four AA-type cells. The screen is a really good size providing plenty of space for the metering and song data, and it can be backlit simply by pressing a hardware button. I still found the text a bit pale, though. Interestingly, the mics have been configured so that both their level and position can be controlled independently. Their level control is, in fact, one little wheel nested inside a larger one. Turning the large one also moves the nested one, but if the smaller wheel is pressed in it disengages and can be offset. Each mic has its own green -12dB indicator LED and red ‘over’ LED, so it’s easy to set levels without looking at the screen metering. As for the position of the mics, the operator is free to move each one into any position its hinge will allow, although the design is specifically engineered to accommodate the standard X/Y and 120-degree positions. Finally, although there are no XLR inputs, the D100 has a plug-in powered mini-jack input, which accepts both analogue and optical signals (there’s a matching output jack too) and a little hardware switch nearby which allows for quickly swapping from the mics to the jack. To get perspective on the D100’s sound, I set it up next to Zoom’s H6, matching the mic positions and levels as closely as possible and recording the same sources. It was interesting to see that when the Zoom’s level was set at 8/10, the Sony matched it with a setting of just over 4/10, demonstrating how much gain is available. Even with the 20dB pad engaged, the D100 had enough level to match the Zoom. Of the two, the D100 had noticeably more mid and lower-mid presence, giving it a sound which reminded me a little of my Neumann KM184 mic’s character. In other words, it is ‘up front’, but the mid warmth does not seem to come at the expense of the bass or top end. In DSD mode, the D100 sounded really good too — and, dare I say, a little smoother than the PCM recordings. The DSD path has its own A-D converter, which might be a contributing factor. I’m told by Sony that the bespoke mics were designed to take advantage of the potential 50kHz scope of DSD recording, and their frequency response thus goes well beyond the 20Hz to 20kHz range. Unfortunately, the bundled copy of Sound Forge LE can’t play DSD files, but I was able to use the freely available Foobar2000 together with an SACD plug-in to play them on my PC. 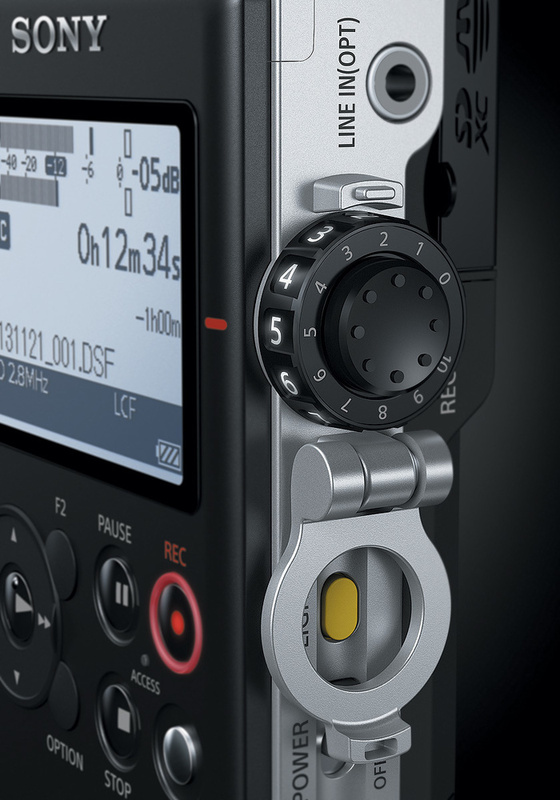 The sound quality is good, then, but one thing to bear in mind is that the PCM-D100 is not really suitable for handheld recording, because the slightest finger touch on the case finds its way to the mics. Some products have better shielding, but mounting a recorder on a stand is really the only option for serious jobs. The D100’s lack of XLR inputs will probably be a deal-breaker for a lot of people, and its inability to do things like act as an audio interface means that it is not the most versatile product out there. 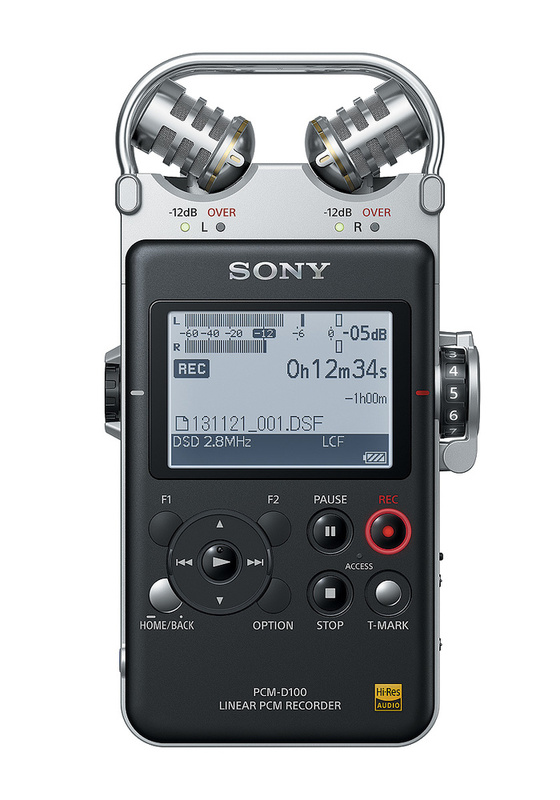 But Sony are banking on attracting customers who just want to record high-quality audio, with the minimum of hassle, and without worrying about mixing it, or setting up and connecting external microphones or instruments. The D100 could easily be mounted on a stand and used to record an important interview, or the performance of a singer-songwriter. It’s also possible to use it for line-level recordings direct to DSD. It’s not cheap, but for audio purists, especially those who are interested in having their first taste of DSD recording, it will probably seem worth the price. Korg’s MR2 is a compact portable DSD recorder with built-in electret condenser mics, which can be angled towards a sound source, but not moved from their X/Y configuration. It ships with AudioGate software for converting DSD files to PCM, and has a number of ‘added value’ features such as a chromatic tuner. It’s also able to record different flavours of DSD, namely DSDIFF, as used by SACD devices, DSF, and WSD. There’s also a function called S/N 100dB, which is designed to increase the signal-to-noise ratio. It works in the same way as the limiter, using two A-D paths with different levels, and dynamically switching between them to improve the input-to-noise ratio. In practice, I found both processes effective. To test the 100dB mode, I tried all sorts of things, like playing from normal to soft on guitar, recording my cat purring from a distance and whispering as quietly as possible, and in all cases the wanted sound stood clear from the unwanted background hiss. As for the limiter, it was only possible to tell when it was working by checking the metering, which, of course, is exactly how it should be. Note that the limiter and S/N 100dB modes cannot be used together, because they both rely on the same auxiliary preamp and A-D path. Also, these tools work only in the PCM mode, because DSD recording is done via its own dedicated A-D converter and signal path. Innovative limiter and noise-reduction tools. 32GB of internal memory can be expanded by 64GB, via a range of card media. Can’t be used as a computer interface. Adjusting the display contrast is not (yet) possible. Has very few ‘added value’ features. Bundled SoundForge LE software does not support DSD. Simple to use, but highly effective as a high-quality recording and playback device. The lack of phantom-powered XLR inputs and the ability to record multiple tracks means that it won’t interest many recording musicians, but it should hold appeal to those wanting to capture high-quality audio without the use of external mics, and should benefit archivists and interviewers, as well as bands and singer/songwriters wanting superior stereo recordings of their gigs.